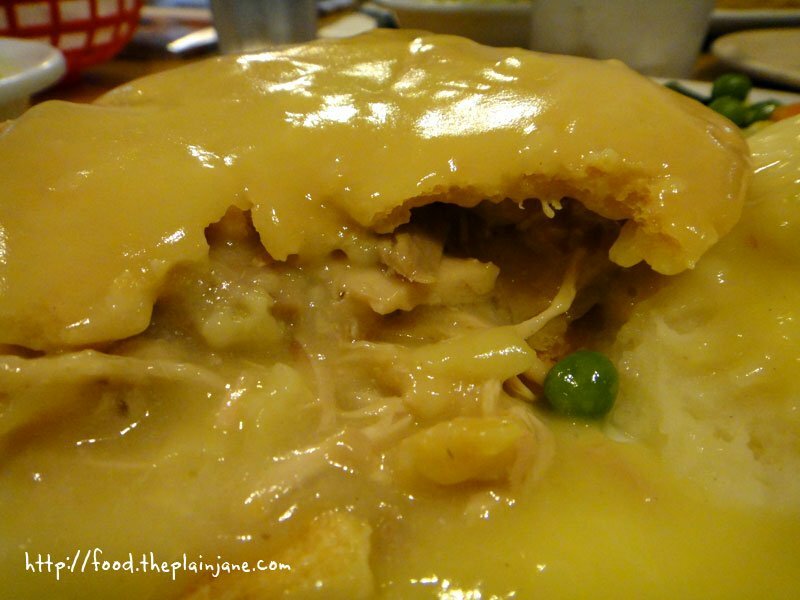 The San Diego Chicken Pie Shop is a classic diner. I’m pretty sure the decor inside hasn’t changed in years. It looks the same as it did when I was a kid. 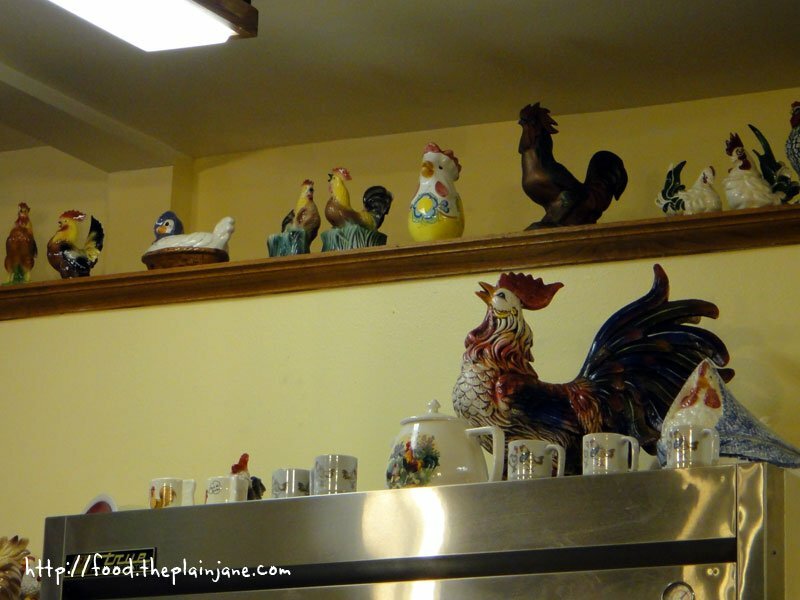 Chock full of chicken figurines with the same old booths and tables inside the restaurant. The only thing that seems to have changed is they finally take credit cards (yay!) and the prices have increased. It’s still dirt cheap, though. 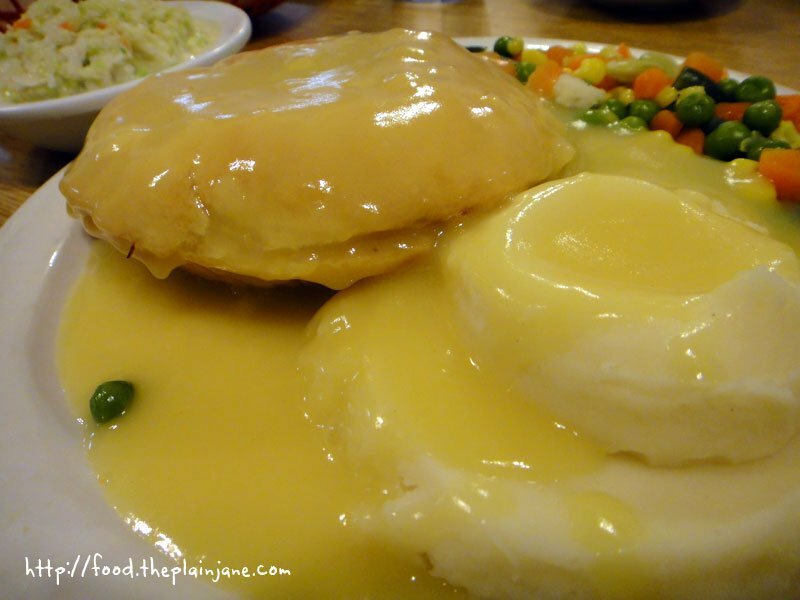 If you’re really looking to save, you can get a chicken pot pie to go for about $2.60! You can also eat it in the shop without any sides, but if I’m going to come here I’m going to have the full pie dinner. With the Pie Dinner ($7.50) you get: a chicken pot pie, mashed potatoes and gravy, vegetables, a bowl of coleslaw and a large handmade roll. You also get your choice of dessert pie after all of this! Jake and I recently went a couple of times. On our first visit, we both got the pie dinner. On a second visit we discovered you can substitute! Neither of us enjoy coleslaw and instead we got double the mashed potatoes. Score! The chicken pot pie has a lovely crust. It’s stays crunchy under all of that gravy poured on top. The inside is only chicken (a mixture of shredded white and dark meat) and gravy. The vegetables are given to you on the side, which I kind of dig. I like to eat spoonfuls of the pie with mixtures of mashed potatoes. It’s filling and quite yummy. 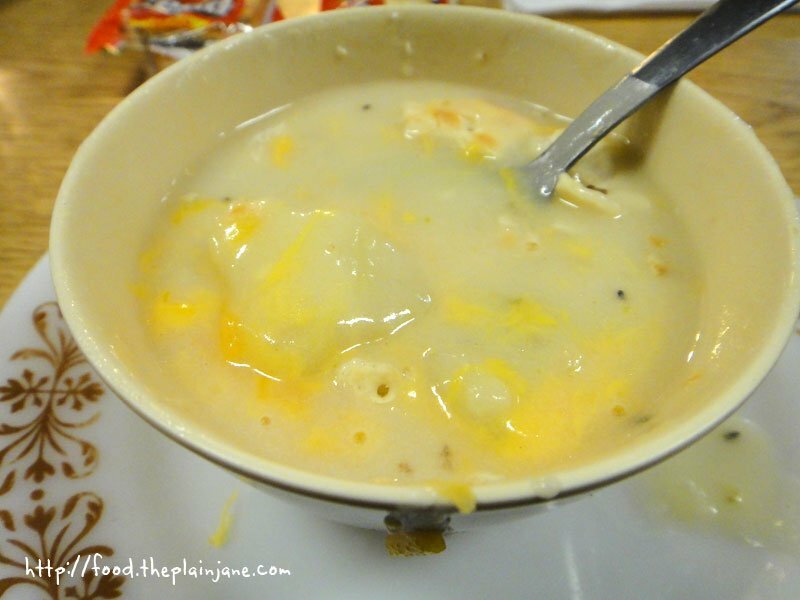 On another visit I also opted to try the soup of the day: Potato Soup. The picture doesn’t look like much, but it was a pretty good soup. It had cheese in it and nice large chunks of potato. Very simple and very basic, but also filling and tasty. Not the best soup I’ve ever had, but it had a good hearty flavor. It also was filling enough to make me not be able to finish my dinner – so much starch! 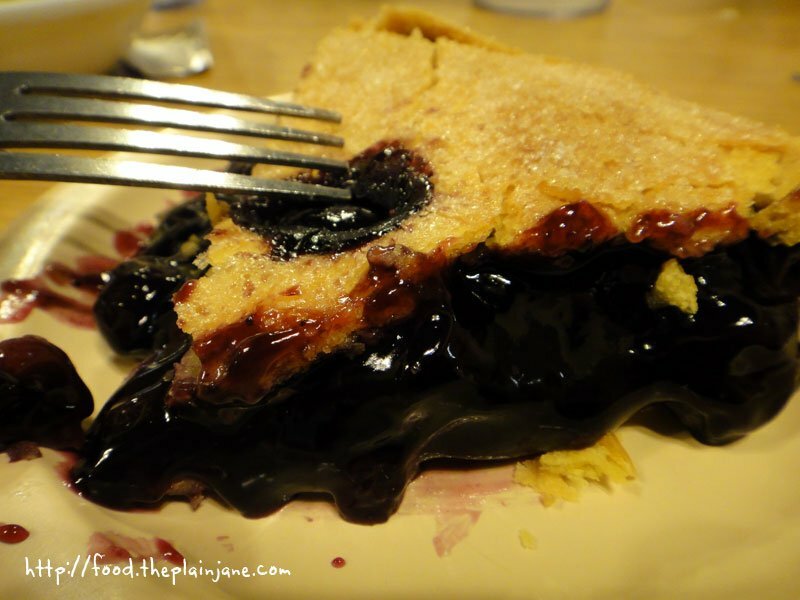 The first time Jake and I went, I got Blueberry Pie. Jake refused his pie and so I took home another piece of blueberry pie that I enjoyed the next day. A few days later Jake told me that he actually wanted his dessert pie, but he thought our waitress was asking if we wanted dessert and so he refused, not knowing that the pie was included with our dinner. After that he was too embarrassed? prideful? to say he did want his pie after all. I scolded him for it and said, “You should have just told me! I would have given you the pie!” He’s kind of silly, sometimes. Second visit resulted in Lemon Cream Pie. Man, this was so good. Not too tart, not too sweet and I loved the whipped cream on top. On our second visit we also took Jake’s oldest son, T, here for his actual birthday for dinner. 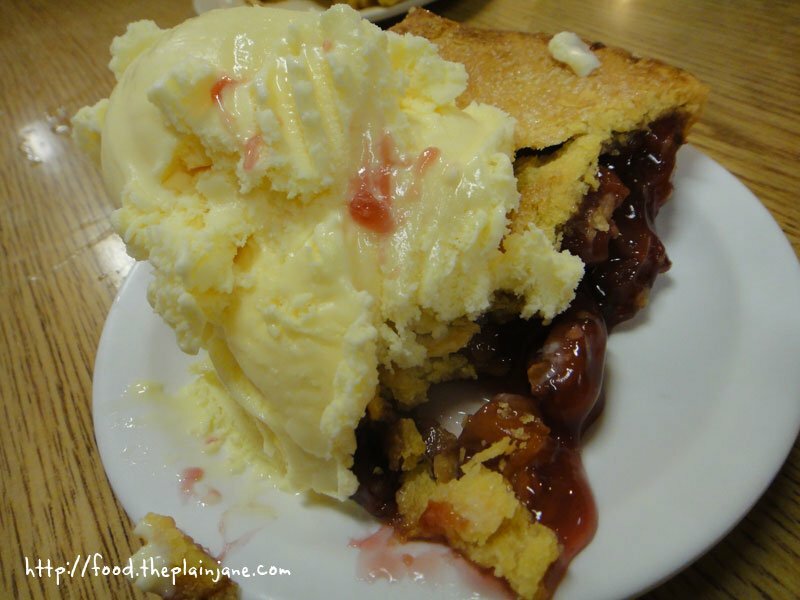 He ordered the Cherry Pie and they gave him ice cream with his pie for his birthday. How sweet! This was also when I discovered that you can get a whole pie to go for only $5.75! 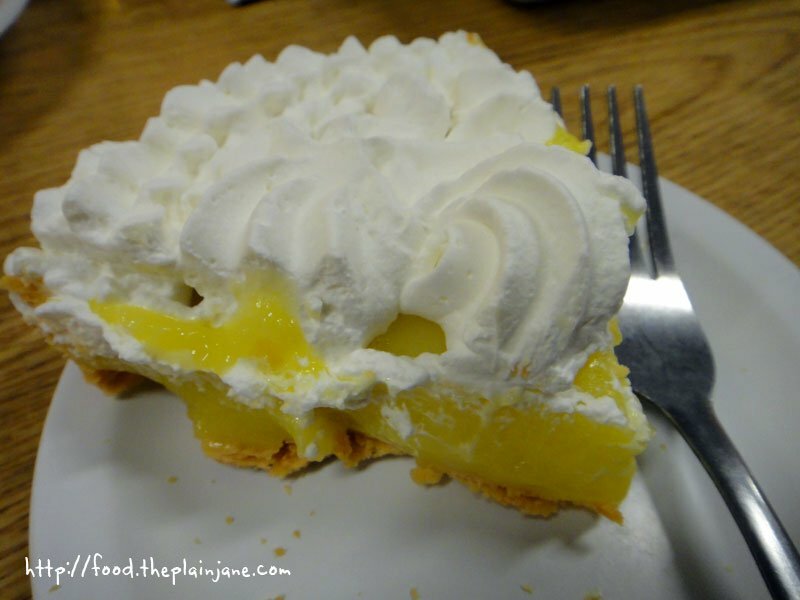 We ended up buying T a lemon cream pie for his birthday since it was so cheap and because the lemon pie was so darn good. I love the Chicken Pie Shop and haven’t gone there in years! They sure have increased their prices. I remember the whole chicken pie dinner going for around $5 but it’s still a great deal at $7. When I was looking up some information about the chicken pie shop I found some prices that listed the pie dinner at under $5 (like $4.85 or something) and that was just a few years ago! Man – I haven’t been to the Chicken Pie Shop in ages! But now I want to go again, mainly because I like getting pie with my dinner. Usually, we go to Chicken Pie Diner in Poway for our pot pie fix, but it’s nowhere near the bargain! I’m sad Jake missed out on his pie! Tell him there’s no shame in “changing your mind” about dessert after it arrives. Sometimes, I’ve gotten dessert to go, but then I end up eating it out of the takeout box at the table because I couldn’t resist. Jake could do that, and then he wouldn’t have to admit he was confused about dessert. i’ve been wanting to check this place out…my daughter would probably like the cafeteria style setting. i would totally eat that crust! forget about the rest of the chicken pot pie (or the dessert pie filling)! Crust all the way! haha. so when you and jake were there, you probably lowered the average age of the patrons to about 50. ok, sorry, that was mean. Hey Leanne – I’ve been to the Chicken Pie Diner in Poway many times! I’ve meant to go there and sit outside with my dog, too, but just never have. I haven’t been there in ages. Hopefully Jake will see the light and not refuse dessert in the future. He knows now that you get dessert when we go here so he doesn’t refuse it anymore! Hi CC! You should go, it’s cheap and it’s tasty! And hahah, yes, we were the “young whippersnappers” when we were there. Hmm… I see a dog-friendly food crawl in the making. We never take our dogs on our errand-running trips, so we don’t really get to eat with them at dog-friendly patios. But it would be fun! ps – if anyone ever needs to borrow a dog, I’ve got extras! I’ve taken Maya out to a few places, but haven’t lately. I’ve been hoping she mellows out with age, but she still gets pretty excited for car rides. Wow… Everything looks delicious! Did not know a place like this existed in San Diego! Thanks for sharing! The boy loves pie (obviously, I do as well, just not as much as he does) and this is SO close to our apartment that it would be a shame not to go. The Chicken Pie Shop is like that elementary school cafateria lunch that you remember loving as a kid. You know it’s not amazing…it’s more nostalgic than anything. Plus, their dinnerware is too good to change. I like that when I walk in that place, I know that the dinnerware, chairs, wallpaper and most of the staff have been there for 60 years. Cheers to the Chicken Pie Shop for bringing me back to 4th grade…nothing but smiles here. Hi Michelle – Food that brings you back warm, fuzzy memories is always a good thing if you ask me! Actually they haven’t been there for 60 years……they moved there from I think it was Hillcrest. yes, that’s where it was, hillcrest…across the street from a gay bar! Tanya! Did you find a recipe? I found this page on the same search you were on and it’s making me hungry and homesick for San Diego.